Well, not a broken heart, but a broken wallet, for sure. So I was in the market for a meal that would be easy on the budget and, for once, not in need of an award-winning wine selection to go with it. Somebody had dropped off a stack of menus for the Asian Isle restaurant at the City Weekly offices, and it looked like just what the doctor ordered. We were greeted warmly for dinner at Asian Isle by a gentleman who doubled as host and the restaurant’s only server. Quickly seated in a comfy booth, we were given cold glasses of water and menus to peruse. There is no beer or wine at Asian Isle, so I didn’t get bogged down with a wine list. And we had plenty of time to survey the menu, since our server/host was temporarily detained readying takeout orders for other customers. No problem; we weren’t in a hurry. And the delay gave my stepson—one of the planet’s pickiest eaters and an emerging food critic himself—time to zero in on something he liked. While that happened, we took in the Asian Isle ambiance. It’s a small restaurant, with intentionally dim lighting but a bright color palette as well—a very appealing spot to dine with the exception of the soft rock radio station which provided the evening’s soundtrack. Barry Manilow is the hamfried rice of American music; I don’t want to spend time with him when I’m tucking into General Tsao’s chicken ($9.95). But soon we had a plate of six porkstuffed potstickers ($5.75) in front of us. The dumplings weren’t remarkable, but did have a nice crisp exterior from sautéing and also didn’t taste like they’d spent time in a freezer. Both egg flower soup and hot and sour soup ($1.75 cup/$5.25 bowl) came topped with a handful of crunchy, fried chow mein noodles. I’d have preferred to have those noodles as a side option. Neither soup was anything to write home to Beijing about, but adequate. I did like that the hot and sour soup came with generous cubes of tofu rather than the microscopic traces you usually see. Unfortunately, I couldn’t find any pork, and only a smidgen of mushrooms in the hot and sour. Unlike standard Chinese restaurants, Asian Isle doesn’t have the typical selection of a dozen chicken dishes, a dozen shrimp/seafood dishes, a dozen beef dishes, a dozen for the vegetarians, etc. It’s a fairly limited menu, but filled with alluring options. There are about a dozen “Favorites,” featuring items like lemon chicken ($8.50), Treasure duck ($12.95) and creamy walnut shrimp ($12.95). There’s also a brief “Noodles & Fried Rice” section of the menu and then “Chef’s Dishes,” which provide some unique options for customization. You select a main ingredient (chicken, pork, tofu, vegetables, beef, shrimp, fish or scallops) and then choose the “style” in which it’ll be prepared. Stylistic choices include the ever-popular kung pao and sweet & sour, along with Asian curry, a Mongolian-style preparation with scallions, Cantonese-style with cashews, and Szechuan spicy garlic, to name a few. So customers can mix and match to their heart’s content. The folks at Asian Isle are certainly not stingy when it comes to portion sizes. The dishes ooze with value. Each entrée comes with a choice of white or brown rice and can easily serve three-to-four people who are sharing. We ordered four main dishes for two teens and two adults and had enough food leftover for an entire “encore” meal the following night. The most delicate dish of the evening was one called Triple Crown ($11.95)—an abundance of plump and tender shrimp, crispy sea scallops and juicy boneless chicken breast pieces bathed in a glistening white wine and garlic sauce with onions, snow peas, miniature corn and crunchy slices of water chestnut. I’m not usually a fan of sesame chicken since, more often than not, it consists of chunks of fatty, gristly chicken in a gloppy sweet sauce. But not at Asian Isle, where the sesame chicken ($8.95) is nicely balanced with a slightly sweet honey tang to offset the salty soy sauce that goes into the glaze. I could do without the bed of fried wonton strips it comes perched upon, but they’re easy enough to discard. 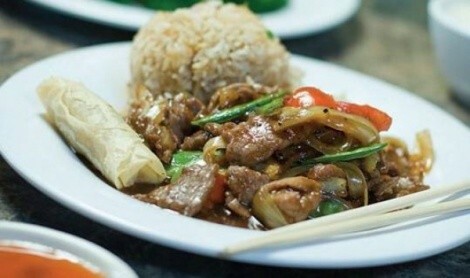 For those who like some heat factor in their Chinese food, I recommend Asian Isle’s beef with black pepper sauce ($9.95). It’s exactly as advertised: Thin, tender slices of beef enveloped in a sassy sauce with a blast of ground black pepper, carrots, snow peas, red pepper and sweet onion. This was my favorite dish of the evening, just spicy enough to get my attention without incinerating my incisors. The “Island Spicy shrimp,” on the other hand, set our mouths ablaze. The fire engine-red color of the sauce should have been a tip-off. Asian Isle’s Island Spicy shrimp is a charitable portion of shrimp tossed in a blistering hot and sweet sauce. It tasted a little like ketchup mixed with honey and hot chili paste, and I think would have been better suited to a less-subtle protein than shrimp—beef or pork, perhaps. City Weekly’s music editor Jamie Gadette said she thought Asian Isle could quadruple their business if they did home delivery in the neighborhood, and I think she’s right. Where have all the Chinese delivery guys gone, anyway? Until that happens, you’ll just need to drop in to this value-laden Chinese eatery and request an Asian Isle seat.